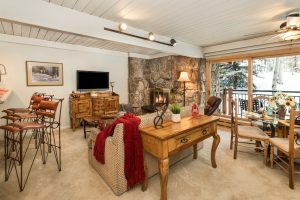 Slopeside Snowmass Condo for sale - virtual tour | Aspen Snowmass Real Estate :: McKinley Real Estate Sales, Inc. This Stonebridge Condominiums deluxe-rated, ski in/ski out condo is in a prime location just off Fanny Hill and the VX chairlift. This turnkey unit has recent upgrades that include stainless steel appliances and track lighting, features a beautiful gas fireplace and huge balcony overlooking the waterfall in the interior courtyard park. 2 Large owner storage closets-1 adjacent to the unit, 1 within the unit. 1 assigned parking space. Complex amenities include an outdoor pool, spa/fitness facility, steam room, sauna, and business center, complimentary airport shuttle,among others. The on-site gourmet restaurant, The Artisan, has a lively apres ski scene. Great for your family getaway, and has a great stable rental history. Call us today for a private showing of this beautiful condo.